Please register and pay online, or at the Art House, in advance of the start of the class/workshop! Classes must be paid for in full before the class starts for you to be registered. For more information and supply lists, please email Cathy Green. Cost: $35- per person or $60- adult with child (8 years and up.) Class size limited to 6. Please bring 3- 8"x10" (or smaller) canvases. Paint included. Optional ornaments, coasters etc. available for purchase during the class. Please dress appropriately. Acrylic Pouring can be messy! A variety of acrylic pouring techniques are taught during each workshop. Techniques vary by workshop. This is a fun workshop that doesn’t require any experience. Just a desire to be creative with color, and have fun! Paintings will need to be left at the Art House to dry, and picked up the following week. **In addition to using canvases during these upcoming classes, ornaments, tile coasters, notecards etc. will be available from the instructor for an additional minimal fee to create pourings on for the holiday season**. Tuesday, April 16 thru May 21- (6 weeks) 10:00a.m.-12:00p.m. Tuesday, April 16 thru May 21- (6 weeks) 1:00p.m.-3:00p.m. Supply List available upon registration. Stephanie is passionate about art and her enthusiasm for painting is passed onto her students. This workshop is for beginners and beyond. Wednesday, April 17 thru May 22 (6 weeks) 10:00a.m.-12:00p.m. Description: A six-week course designed for beginning to intermediate oil painters. This class will be fine tuned to the experience levels of the students. We will be building new skills each week and drawing upon skills from prior weeks’ lessons. If you’re new to oil painting or experienced- but frustrated by previous painting experiences and/or feel you’re not improving- this class is for you. We will be working “alla prima” on smaller canvases, 9x12 or 11x14. Students will be participating in various “painting exercises” with lots of coaching at their easel. Instructor will demo. A Focus on Composition, Shape, Value, Color and Edges will be emphasized. Plus a lot more! Course Description: In this class you will be creating your won mandala and will then add color to it. The instructor will discuss the history, technique and meanings of mandalas, colors etc. Music is also an important part of this process…This class is for beginners and beyond. Come prepared to relax and enjoy yourself while creating your own unique piece. Ages 16 and up or Age 10 and up if accompanied by an adult. Cat’s Description: This is a one day oil painting class, using Bob Ross’s Wet on Wet painting technique. 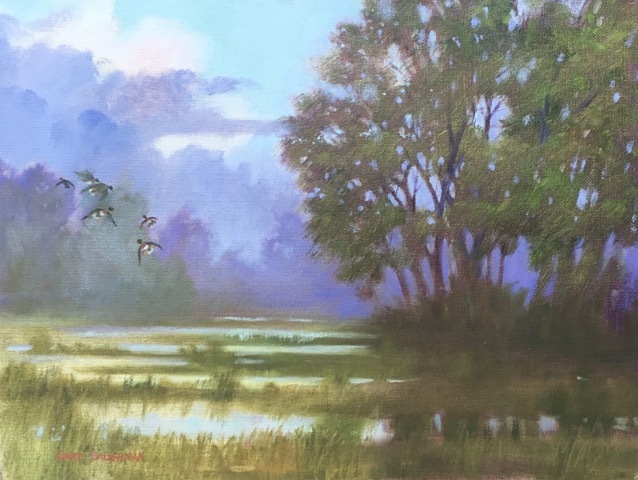 You will complete your very own painting with step by step instruction during this class. Please bring and apron or something to wear over your clothes- or wear something you don’t mind getting paint on. Please bring a bag lunch and a beverage. We will take a short lunch break. Water and a light snack will be provided. Cost: $60 per person All Supplies Included. Ginny is an experienced silversmith and jewelry designer, who is passionate about what she does and wants to share it! She will provide the tools for the class as well as show you how to use them. Course Description: this class introduces you to the art of jewelry chain maille. You will learn about wire, it’s properties and how to make and use jump rings. The project for the 2/23 class will be making a bracelet with a 2-1 or 2-2 link design, covering different variations for the design including adding beads. We will also cover clasp and earring wire making to end our project. The project for the 3/2 class will be making a byzantine bracelet. Additional materials will be available for purchase during these classes if desired. Fridays, 1-3PM (8 weeks) COMING AGAIN EARLY FALL! Course Description: This theoretical and practical course will help beginner and medium level students learn to draw, but the most important thing is to have fun! We will review various drawing techniques and basic principles. You will practice with the essentials and find which one will suit your interests. What is required is your own desire to draw, the normal use of our senses and constant practice. To start a deeper investigation into the visual world, we will comment along the way about some history of these beautiful and amazing techniques. Cost: $35- per person All Supplies Included. Class size limited to 6. Laurel’s Description: this is a one day class of paper making and paper casting. Laurel will demonstrate the process and then help each person with their own pieces. Please dress appropriately…It can be MESSY! Please bring a “cookie sheet” with sides or a flat type box or container to transport your pieces home at the end of class. Cost: 85.00 per person. All Supplies Included. Description: Make art that captivates and intrigues! Using painted and altered papers, baubles and treasures from the instructor’s own studio stash, you’ll create a unique mixed media work that will awe your friends and family. In this fun one-day workshop you’ll learn easy ways to make gorgeous painted papers and stamps, and will then use these along with “found” items, fabric scraps, beads, styrofoam and other materials to create a finished work with dimensional depth. Class size is limited to 8 so that each participant receives lots of one on one attention from he instructor, a professional artist whose work is held in private and corporate collections throughout the U.S.
No art experience is necessary. You do not need to know how to paint! Beginners to advanced, all are welcome.Invite a friend or two to join in the fun and make a day of it! Please bring a sack lunch, snack and beverage. Cost: $55- per person. All Supplies Included. Description: You will spend the first day of this 2 day workshop creating your clay pieces…dishes, bowls, animals, the sky is the limit. Maria will fire your pieces in her kiln and will bring them back for the second class so you can glaze your pieces. Maria will take your pieces to fire them again after they have been glazed. They will be brought back to the Art House for you to pick up after the second firing. No previous experience is needed. Dress appropriately! Clay and glazes can be messy. Cost: $50- per person. All Supplies Included. (Ages 8-13) Class size limited to 6. Cost: $40- per session. All Supplies Included. (Ages 6-14) Class size limited to 6. Description: You will spend the first day of this 2 day workshop creating your clay pieces…dishes, bows, animals, the sky is the limit. Maria will fire your pieces in her kiln and will bring them back for the second class so you can glaze your pieces. Maria will take your pieces to fire them again after they have been glazed. They will be brought back to the Art House for you to pick up after the second firing. No previous experience is needed. Dress appropriately! Clay and glazes can be messy. Bring your own snack/beverage if desired, and be ready to have fun with clay! Cost: $60- Adult with Child (8 years and up) Class size limited to 6. Please bring 3- 8"x10" (or smaller) canvases per person. Paint included. Optional ornaments, coasters etc. available for purchase during the class. A variety of acrylic pouring techniques are taught during each workshop. Techniques vary by workshop. This is a fun workshop that doesn’t require any experience. Just a desire to be creative with color, and have fun! Paintings will need to be left at the Art House to dry, and picked up the following week. **In addition to using canvases during these upcoming classes, ornaments, tile coasters, notecards etc. will be available from the instructor for an additional minimal fee to create pourings on**. Cost: $60- for child with adult (children ages 8 or older) Class size limited to 6.